I invite those playing in the Kenilworth Championship to post tonight's results and games as comments. Mark Kernighan, Ari Minkov & Bob Sherry won last night while I missed 6 wins & had to settle for a draw against Don Carrelli. updated 2/29 at 6:55 p.m.
All the U1800 games from round 5 have been added to the java-replay page & PGN file. Again, thanks to TD Geoff McAuliffe for "Fritzing" them. I'll try to get the Minkov-Kernighan draw for you. Mark Kernighan beat Don Carrelli while I lost to Ari Minkov. Ed Rodda is officially out. Justin Roach, Joe Demetrick & Joe Renna won last night over Dmitry Yampolskiy, Ted Mann & Gordon Agress. Jim Cole withdrew and his results were nulled but there will be no change in format. Here are four of the five 6th round games : replay & PGN. Notes & next week's pairings will follow in a few days. 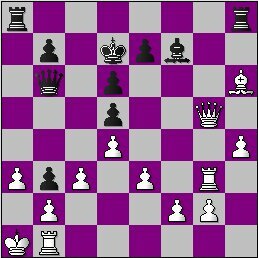 notes to Minkov-Moldovan uploaded 2/24 @ 10:45 a.m.
... and give you the java-reply & PGN links to my games (+4-1=1, 1907 PR). Playing at the USATE? 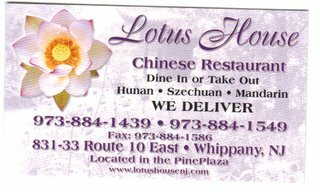 Looking for a good place to have lunch or dinner? 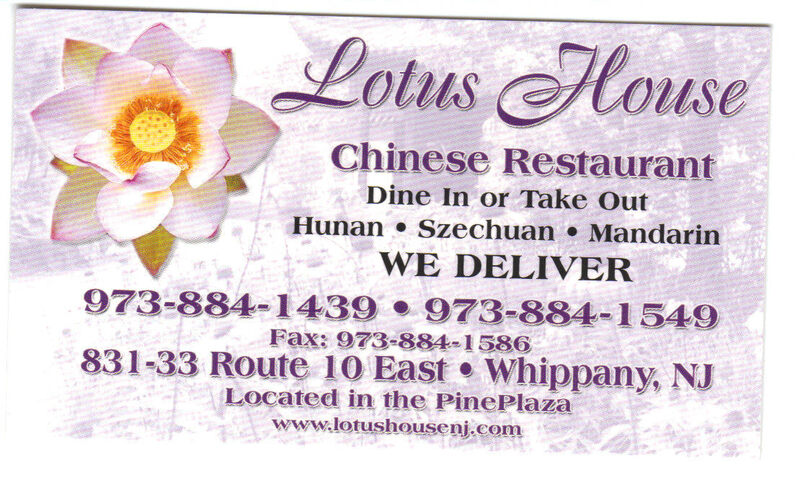 I highly recommend the Lotus House Chinese Restaurant on Route 10 East in Whippany. It's a little pricer than some other joints ($8.75 for Eggplant with Garlic Sauce) but very good! P.S. - I'll upload the raw scores of my games Monday night. Round 1 - 1:00 p.m. Round 3 - 11:00 a.m. Round 4 - 6:00 p.m. Round 6 - 3:30 p.m. This will be my first U.S. Teams experience &, quite frankly, I'm not looking forward to it at all. 6-hour games?? My record is 3:15. Oops. Forgot to mention that KCC members Mike Wojcio, Glen Hart, Jack McCorkell, Ted Mann, Leon Hrebinka and Chris Lim will also be playing in the event. Also - Ari Minkov, Ziggy Bliznikas, Max Sherer, Justin Roach & Ian Mangion. Lim-Roach, Hart-Yampolskiy & Demetrick-Cole from the 3rd round; as well as Yampolskiy-Demetrick from round 4. Please be aware that scoresheets are, by USCF rule, property of the TD! and a copy should be submitted. The club recently purchased 400 carbon scoreheets for that very purpose!! Mike Wojcio grabbed a share of the 'A' group lead with a win over Ian Mangion while Glen Hart beat Chris Lim for his 4th straight game to stay atop the 'B' group. Ted Mann & Bert Shiffman also won; against Dmitriy Yampolskiy and Gordon Agress. However, Jim Cole took byes for this round, 2/21 & 2/28 and Justin Roach either took a bye or forfeited to Joe Demetrick. You can go through my game and notes here or download them. The rest will have to wait until after the USATE. UPDATE : Roach took a bye & is still in the event. NM Mark Kernighan won his 4th round game and now leads with 4.0, Minkov is 2nd at 3.5 while I'm 3rd with 2.5. Along with Mark's win, full notes to my game with Renna have been uploaded to the week's replay page & PGN file. Ari Minkov beat Ted Mann to take over the top spot but 3rd-round leader Mark Kernighan can regain it with a win vs. Don Carrelli tonight (Springfield Barnes & Noble, 8:30). Bob Sherry won easily against Joe Azzarello while I struggled to defeat Joe Renna. 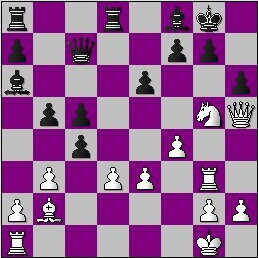 My opponent played very well and had a clear plus at one point. ... which will be on Feb. 24th. We are skipping a week to accomodate those playing in the USATE (2/16-18). Full notes to my game will follow at some point. Dr. Seymour (Sy) Fish, a founding member of the Kenilworth Chess Club, died Wednesday at the age of 80. I think we should honor him and Irving Ellner in some way - perhaps with a memorial tournament; as the Checkmate CC did last year with the John Hoffman Swiss. NM Mark Kernighan held on to his half-step lead by smashing me in 18 moves. Ari Minkov kept pace with a forfeit win and Sherer-Carrelli was agreed drawn with White in a winning position. The bye problems are worsening. With Pat Mazzillo having to withdraw, there are now 2 uneven groups. Perhaps the only solution is to combine them & change the format to a 12-player RR. As for the games, Ian Mangion made up for his erased win (over Pat) by defeating Joe Renna, Mike Wojcio beat Bert Shiffman, Ted Mann won against Jim Cole & Joe Demetrick received a forfeit victory from Dmitriy Yampolskiy. Here are the crosstables for the Open, U1800-A & U1800-B sections. You can play thru both open section games here or download them. The U1800s should follow in a few days. annotated Cole-Mann uploaded 2/8 @ 9:39 p.m.
fritzed Shiffman-Wojcio added 2/11 @ 4:49 p.m.
fritzed Mangion-Renna added 2/15 @ 2:55 p.m.
Ari Minkov & Don Carrelli finished off the 3rd round with wins over Bob Sherry & Ted Mann. java & pgn links fixed 2/8 @ 3:27 a.m. Thanks to Don for pointing out the error. NM Mark Kernighan beat Max Sherer to take a half-point lead. Ari Minkov overcame 4 lost positions against me and swindled a draw but he missed 2 wins along the way (turns 36 & 37). Ed Rodda, who was a no-show, forfeited to Don Carrelli. Division leaders Ian Mangion (who already has a 2 point margin) & Glen Hart took their 3rd-straight games but there were 2 big upsets. Joe Renna (1164) beat the A group's #2 seed, Mike Wojcio (1621) & young Kris Lim (1050) held the 'B' group's #1 seed Justin Roach (1711) to a draw! Joe Demetrick also won. You can play thru my fully annotated game here or download it. The rest should follow in a few days. Agress-Mangion & Renna-Wojcio added 2/4 at 1:40 a.m.